Compline Choir Featured on MPR's Regional Spotlight! St. Paul, Minn. � Since 1992 a group of men ages 18 to 70, men who come from all walks of life, have come together every Sunday evening for an hour of quiet, spirit-filled singing. The twin cities Compline Choir gathers for a monastic service that dates from the 6th century, a service for the close of the day or Compline. The ensemble celebrates its 20th anniversary with a 4 pm concert Sunday April 29th at Central Lutheran Church in Minneapolis. Through their website the ensemble's performances have been heard on all seven continents. Steve Cornils, one of the founding members of the group, says the discipline of being a part of something that is both ancient and contemporary is deeply moving. The Compline Choir is in this week's Regional Spotlight. Click HERE to be directed to MPR's Regional Spotlight page and audio file. They have been sending their healing, calming tones over the airwaves for the past two decades. The Minnesota Compline Choir, a churchly version of the Energizer Bunny, just keeps on going, Sunday after Sunday, as it has since 1992. Founded at Central Lutheran Church (ELCA), Minneapolis, the choir sang there beginning when the Rev. Steve Cornils was senior pastor. Now on the pastoral staff at Mount Olivet Lutheran in southwest Minneapolis, Cornils still sings with the choir, as he has since its inception. He is a co-founder of the group, along with Charles Parsons, who was music director at Central 20 years ago. Originally, the choir found a Sunday-night program slot on WCAL-FM, the highly-respected radio service of St. Olaf College. Reports from the station manager indicated that the weekly Sunday night Compline Choir broadcasts were the most widely listened-to program broadcast from the Northfield campus. 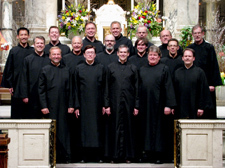 After the sudden and unexpected sale of WCAL to Minnesota Public Radio in 2004, the Compline Choir broadcasts were put in jeopardy. A Twin Cities station, KKMS-AM (980), has been airing the services in recent years (currently at 11:30 p.m. on Saturdays). But many Lutherans have some resistance to tuning in to a station mostly dedicated to conservative Christian programming. Choir member Jeff Anderson, who provides technical support, reports that visitors from 31 separate countries and territories have logged onto the website. The choir�s current director is Clarance Smith, an accomplished church organist and a member of Central Lutheran. Clearly he loves the choir, because he�s agreed to serve without salary. Previous directors were compensated; but funding, much of which originally came from Central, was finally depleted. A special service marking the choir�s 20th year is planned for Central Lutheran on April 29. Smith says the 16 singers have shown commendable resilience and flexibility in recent years. No longer anchored at Central, they have sung of late in a variety of venues � Hamline United Methodist in St. Paul, the Basilica of St. Mary in Minneapolis, Assumption Roman Catholic Church in downtown St. Paul, and Mount Olive Lutheran Church (Chicago Avenue) in Minneapolis. There are also concerts in area congregations, sung on request. During Lent this year the choir will sing in area churches. During the Easter season, the venue will be the Basilica in downtown Minneapolis. A special service marking the choir�s 20th year is planned for Central Lutheran on May 6. Metro Lutheran will carry details as the time draws nearer. One unexpected bonus that comes from having the compline broadcasts available on the Internet is that a listener can create his or her evening prayer schedule and have the service available at precisely that time. So, an individual inclined to have evening prayers at 9:00 p.m. each evening can go to the Minnesota Compline website, click on �listen,� and end the day in the most contemplative way possible. In today�s hectic environment, that�s a gift that keeps on giving. Opportunities for providing financial support for the choir are listed at the choir�s website, www.minnesotacompline.org. Copyright 2012 MetroLutheran. All rights reserved. First, the sacred voices of the Minnesota Compline Choir were silenced on the Sunday night radio waves. Then, the choir lost its church home in Minneapolis. Now Compline � an ancient form of evening prayer � is being sung in St. Paul at Hamline United Methodist Church, across Englewood Avenue from the university of the same name. The solemn chants and hymns of the all-male, 24-member Compline Choir were a longtime fixture on WCAL-FM 89.3. But the live broadcasts were dropped last year when Minnesota Public Radio bought the station. Soon after, Central Lutheran Church in Minneapolis ended its sponsorship of the choir, directed for 14 years by Chuck Parsons. But then Parsons became music director at Hamline, and the church also welcomed the choir. A 30-minute Compline service � open to the public � is held every Sunday at 8:30 p.m. The service also is back on radio, broadcast at 8 p.m. Saturdays on KKMS-AM 980. In the sleepy hours of a Sunday evening, radio becomes a very visual medium. It paints pictures of solemn monks chanting prayers by candlelight, pipe organs furiously shaking cathedral foundations and preachers mopping away brow sweat as they sermonize into the quiet night. Several mainstream stations take on this sensory, sacred air as the weekend draws to a close. Minnesota Public Radio carries "Pipedreams," a pipe organ program at 9 p.m. that blends the sacred and secular. WCCO-AM broadcasts Billy Graham's "Hour of Decision" at 11 p.m.
And for nearly a decade, the chanting of 20 male singers at Central Lutheran Church in Minneapolis has been heard at 9 p.m. on WCAL-FM 89.3, a public radio station out of St. Olaf College in Northfield. Nothing on radio quite matches the live broadcast of Central's "Prayer at the Close of the Day," or Compline (COMP-lin). The Compline format of chanting, prayer and readings comes from an ancient tradition, observed today mostly by Episcopalians, Roman Catholics and Lutherans. The choir members who perform Compline sound like monks. When they put on their simple, black robes for the broadcast, they even look like monks. But they are morticians and bankers, chauffeurs and stay-at-home dads -- married and single men from 25 to 65 who live throughout the Twin Cities. "There's a lot of diversity, but we come here to sing," said choir member John Luehr, a psychiatrist from Eden Prairie. "What would bring all of these different people together? It's the singing. The mission brings people together." It apparently draws listeners, as well. "The few times it has been pre-empted, we really hear about it," WCAL general manager John Gaddo said. "Listenership is not typically strong on a Sunday evening, but when the Arbitron survey comes in, there's always this nice little swell of an audience that comes in for Compline." Compline prayer is part of a Christian tradition known as the liturgy of the hours, or prayers for specific times each day. Also known as the daily office, the biblically based practice of "praying without ceasing" includes morning, midday and evening prayers. As the prayer at the close of the day, Compline is contemplative, quiet and reflective. Although the hymns and scripture readings may change with the day, the prayer itself is constant. Frequent listeners know that when the choir chants "The Lord almighty, grant us a quiet night and peace at the last," Compline prayer has begun. In practice, it begins two hours earlier each Sunday, when the choir assembles downstairs at Central Lutheran to rehearse. Charles Parsons, who formed the choir and has been its only director and organist, commands with a demeanor that is easy-going yet fully expectant of precision. Choir members join by audition only, and there is very little turnover from one year to the next. "I feel very strongly that if a choir doesn't chant well, it doesn't sing together well, because it's so basic," Parsons said. "But this group gets along very well. They care very much for each other. That can't help but come out in the singing." The sung chants evoke a spirituality that is "profound and deep," said choir member Clarance Smith, who recently moved to Seattle. But when the 20 singers speak the Lord's Prayer in unison, it is equally stirring, almost haunting in a holy way. "Some of us have been together for so long that we breathe at the same time without having to rehearse it," said Les Rosecke of Richfield, who has been with the Compline choir from the beginning. Because Compline is a live broadcast, the choir's level of concentration is high. About 8:55 p.m., an expectant silence ascends throughout Central's cavernous sanctuary. There is not even a rustle for five minutes, until Parsons gets a warning light on the organ and holds up his open hand as a five-second signal to the choir. The service then begins with an organ prelude and ends exactly 28 minutes later. "When those little red and green lights go on, it's just like my mind goes devoid of every other concern," Rosecke said, "and for that half-hour, my mind never wanders. Any other thoughts and worries are gone. I love it. I could do it every night." Compline and WCAL have a mutual relationship. Paul Peterson, former WCAL general manager, knew of Compline from a long-time live broadcast on a commercial station in Seattle. It attracted fans in surprising numbers, "with a particular appeal to young people," said Peterson, who has retired from WCAL but still hosts the Compline broadcast. Peterson thought Compline would be a good fit for the mostly classical programming of WCAL. Parsons and Steve Cornils, then Central's pastor and still a Compline choir member, were eager to start a Compline service and have it aired on radio. Central's Compline service has been broadcast nearly every Sunday since its founding and will celebrate its 10th anniversary next April. The radio broadcast conceals the fact that maybe only a dozen people actually attend the Sunday evening Compline service, although anyone is welcome. "When people do come, they usually say they came to see what they heard on the radio," Parsons said. "Often they say they like what they heard better. It's very, very peaceful, very gentle. They say they like to put their jammies on and listen at home."